Yes, there really is a patent for every occasion. Today being April 15, the infamous U.S. Income Tax filing deadline, U.S. Patent no. 7,765,132 seems perfect. The patent entitled “Tax Refund System” was issued just last year, and is owned by none other than uber-filers, H & R Block. This business method patent is essentially covering the idea of advancing a tax refund, which I believe is referred to as an “Anticipation Refund” by H&R Block, in combination with preparation and filing of the tax return, and assignment of the refund to the preparer. Interestingly, there is legislation currently being debated in Congress that may (some say likely) prohibit tax methodology patents, particularly those directed at tax mitigation. I haven’t seen much in the popular press, but details of that proposed legislation can be found, for example, at http://www.aicpa.org/InterestAreas/Tax/Resources/TaxPatents/Pages/Legislation%20Addressing%20Tax%20Strategy%20Patents.aspx. 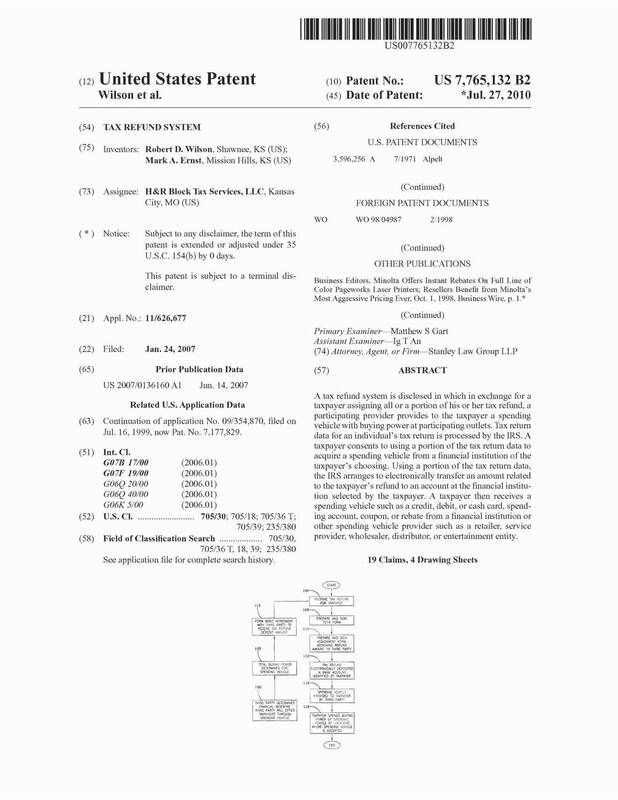 Today’s Patent of the Day may survive nonetheless, because tax mitigation is not the focus. Simply a more expedient receipt of funds…for a fee. A glorified payday loan perhaps? If you’d like to read the details and decide what you think, click over to http://www.innovativeip.us/images/US7765132.hrblock.pdf. Enjoy!